Mountain Pie Co. St. Patrick’s Day pie special! 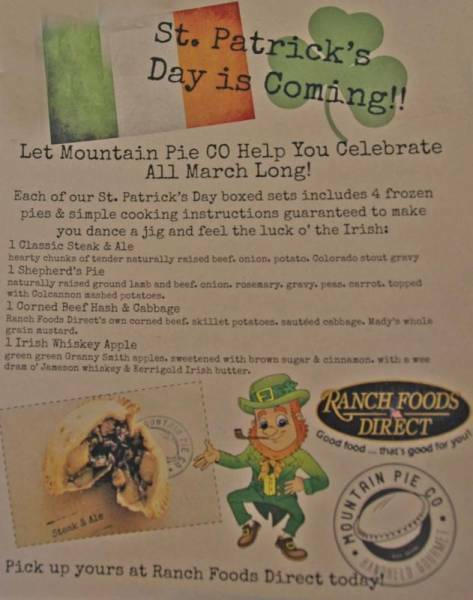 From Mountain Pie Co., a special seasonal 4-pie pack, AVAILABLE ALL MONTH LONG, that includes four wonderful gourmet hand pies with an Irish theme. Corned beef hash and cabbage? Irish Whiskey apple pie? The picture describes them all or download a copy of the flyer here. Plus… Shop Ranch Foods Direct for corned beef brisket, banger sausages, beer brats and more!